In a closely fought contest, the men’s health celebrity team narrowly triumphed over the Men’s Health week partners in A Question of Health, the all action health and sports quiz specially designed to sound the starting gun for this year’s Men’s Health Week with a bang. Rugby league legend Steve Prescott, former world darts champion Andy Fordham, ex-Charlton goalkeeper Nicky Johns and Gardeners’ World presenter Joe Swift combined their talents and men’s health commitment to tackle a series of fun questions designed to raise awareness of men’s health issues and how they link with sport and exercise. Despite the array of talent on the park, the conflict was at times, of dubious quality (think France-Uruguay). At mid point, the celebrities had zero points but were still leading as the partners team were on minus one – the result of decision by question-master Keith Arthur, presenter of radio's Fisherman's Blues, to deduct points for incorrect answers. The titanic struggle took place at West Ham’s Upton Park football ground on Monday at the launch of Men’s Health Week. The partners team had been selected from among the 130 men’s health activists from partner organisations packed into the Legends room through a preliminary round. Surrounded by larger than life size images of Geoff Hurst, Bobby Moore and other Hammers stars, new public health minister Anne Milton presented the prizes to the competitors and, in her first speech on men’s health, put the weight of her government behind the Forum’s campaign to get a million more middle-aged men exercising regularly before 2012. But even the weight of the government won’t be enough to move a million of us. The ball’s in our court. Let’s move. 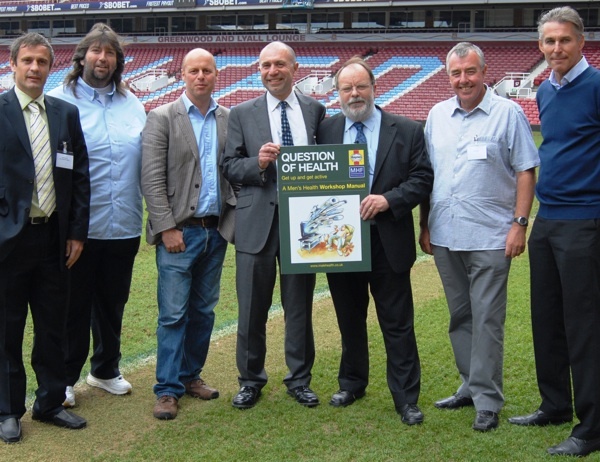 Below: Steve Prescott, Andy Fordham, Joe Swift, MHF CEO Peter Baker, MHF president Ian Banks, Keith Arthur and Nicky Johns on the Upton Park pitch before the quiz. Submitted by Visitor on 16 June 2010 - 10:10am. This is such an important issue, I hope the new government really do support it.